Last Dance: Did You Realize Kim Clijsters is still playing professional tennis? Well, Clijsters is quasi-semi-demi still playing professional tennis. The Belgian former World No. 1 is on a lengthy farewell tour set to conclude after this year's US Open. Clijsters' long goodbye could rival Cher farewell tour in everything except maybe the sequin count...there's still time, Fila. Clijsters is playing limited engagements. She was 13-3 coming into today's match with Jelena Jankovic. It's late June but Clijsters is playing only her fifth tournament of the year. An ankle injury and a wonky hip have truncated what was already scheduled to be a limited run in 2012, forcing her out of Roland Garros. Then an abdominal tear shortened her preparation for her final Wimbledon. Today, it looked like she'd always been here. Clijsters was in fine form on Day 1 of these Championships, ousting the slumping Serb, Jankovic 6-2, 6-4 in an impressive display of low-slung power tennis. Facing the 18th seeded Jankovic in the first round was a bit of a cruel blow for a woman who little over a year ago was World No. 1, but Clijsters was philosophical, "Not being seeded, obviously it's possible that you draw a high seed. So you have to be ready from the first match onwards." To get through today, Clijsters relied on her own aggressive groundstrokes as much as errors from Jankovic to get through today. The Belgian needed an hour and 21 minutes to get through her first round (two minutes more than Roger Federer needed to get through his three sets). The win extended Clijsters' farewell run in London by at least one round. Considering most players build to their best tennis through the course of a tournament, Clijsters early round form indicate that she might be in line for a little metallic flash of her own...hold the sequins. 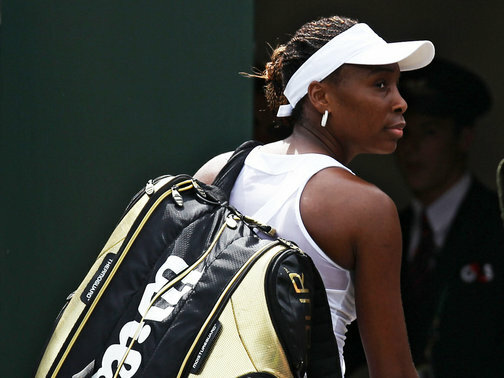 Venus Waning: She's been the world's best player, she's been the best at Wimbledon five times. Arguably, the greatest grasscourt player of her generation, Venus Williams slumped to defeat today 6-1, 6-3 to Elena Vesnina. Venus has always been a bit of an erratic player, credentials aside. Her strokes, always more prone to break down than those of her baby sister, were less the problem today. She seemed to lack the energy to compete at the level we, and she expect from a champion of her caliber. Williams, known for her big serve, delivered just 38% of her first serves today on her best surface and won less than half of all of her service points. Most disturbingly, the preternaturally graceful Williams' shoulders slumped with defeat before match even finished. Granted the Russian took the first five games emphatically, Venus' hope was next. Broken, like her serve, four times in the first set and five times all told. Vesnina is a quality opponent, but the loss led almost ev'eryone to a single, understandable response: "How many times will we see Venus Williams on court again. Almost everyone's mind was there after her listless display, save the former No. 1 herself. "There's no way I'm just going to give up," Williams said. "That's just not me. I'm tough, let me tell you, tough as nails." With Venus as with her younger sister, defiance, in their younger days, help make them world beating champions. Today, the bluster sounds like exactly that. Venus' results on grass have long outstripped what's she's been able to do on other surfaces. Having been drubbed at the tournament where she usually gives the best account of herself, Williams has at least one fortunate thing in her favor, she will have a chance in a few short weeks to redeem herself on the same courts, at the Olympics. Williams comes into the London Games as a three time gold medalist...playing at Wimbledon where she's a five time champion. Maybe a double dose of good memories will get her over the hump. We certainly wish her well. The Voice: Maria Sharapova advanced today with relative ease over Aussie Anastasia Rodionova 6-2, 6-3. That's not why she's pictured here. No, today, Sharapova graces Blacklabel Tennis because the WTA announced measures to "drive excessive grunting out of the game for future generations," according to WTA CEO Stacey Allaster. Since the days when Monica Seles roamed the baseline there have been discussions, debates and diatribes about grunting on the pro tour, especially among the women (and in recent weeks Marcel Granollers). Well, Granollers will continue to go unchecked, as will the oft-vocal likes of Victoria Azarenka and Maria Sharapova. The WTA's plan is to focus on training young players so that their exhales don't turn into grunts as they reach the upper echelons of the sport. There are legitimate complaints in the ether that grunting keeps players from hearing the ball and being able to adjust their movement and shot selection accordingly. We agree that the Azarenka caterwaul can be a distraction as one of her laser backhands screams at you at around 80 mph. The greater concern seems to have been that fans were complaining about the noise made by grunting players. We've been silent on the issue thus far, but here's our take: Move on. Tennis is a sport. It may be played by beautiful people, but it is neither a beauty contest, nor an aesthetic pursuit. While Roger Federer, for example, may play a kinetically fluid, "beautiful" game, the reason you buy t-shirts and watch him play on the weekends is because he's an ATHLETE. Athletes, with the potential exception of Federer, sweat, they grind and yes, at times, they grunt. It happens in other sports too, but because fans are asked to be quiet in tennis, the piercing of the silence by a Sharapova looms larger. Do we enjoy the grunting? No, but we love tennis. Grunting is a part of the game we've accepted as long as we've been watching...and we're prepared to continue both accepting and watching. While people that will surely have just about any wristwatch constantly placed fake prada bags presents itself his or her listing, that may be a wonderful testament on the draw involving fake hublot watches lovely swiss wrist watches. In case many of us mention your imitation designer watches, fake breitling watches which may have these kind of capabilities charge more when compared with a few other imitation designer watches, the high quality you get can be worthy of the other investment property. In fact, you may certainly wasting much less when compared with you'd probably for the legitimate fake gucci bags! There isn't a various other enjoy on this planet that will becomes replicated just as much as cheap dior replica and it is as a result of stature along with extravagant price ranges that they demand. In a big tournament, we have found big names of professional players. They are eligible to serve fair and exciting games with full of nail-biting moments. Especially in big tournaments with big popular players, we can get some exciting matches, here also, we can get some crucial review and updates about the 2012 Wimbledon games and known about the possible tricks.